The High Pass is Photoshop’s most powerful and simple sharpening filter, yet isn’t even listed in the Filters > Sharpen list, as such it is often overlooked in favour of the traditional sharpening tools. Though the High Pass isn’t technically a sharpening filter, it often delivers superior results; producing sharper images, with less noise and artefacts than the ‘usual suspect’ filters like the Unsharp Mask, which make it my go to filter for output sharpening. Sharpening increases contrast along an object's edge; the edge’s light side becomes lighter and the dark side becomes darker, our eyes perceive this increased contrast as more detail and clarity -- i.e. sharpness. The main strength of the High Pass filter above Photoshops’ other sharpening tools is it an edge detection filter. It exclusively finds and highlights edges, applying a 50% neutral grey to everything else in the image, which is then ignored by the filter. The result can then be combined with a contrast boosting layer blend mode, which leaves any non-edge detail untouched and in doing so avoids haloes and artefacts or unwittingly enhancing any existing noise. A High Pass sharpening is also non-destructive, being applied to a copy of the source image, so nothing irreversible happens to your initial image. The untouched original also makes reviewing pre and post sharpening easier by simply toggling layers. 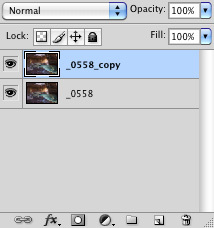 To get started, first make a duplicate layer. 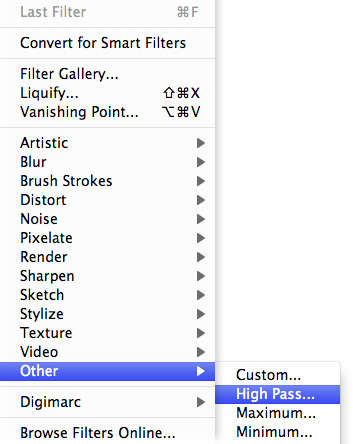 With our duplicate layer selected, set your blend mode to Overlay. Don’t panic at the resulting hyper-colour image, that will remove itself in the next step. The reason for setting a blend mode pre- sharpen is so can see the sharpening applied in real-time rather than on a grayscale preview image in the filter dialogue. The dialogue box will pop up and at the same time your image will lose the day-glo look and return to normal. Now you can begin to sharpen -- and see it’s effects in the background directly on the image. Drag the slider right to add sharpening, drag left to reduce it. You’re going to want to start off with a low radius value, somewhere between 0.5 to 1.5. Rarely have I cause to use anything higher than 2 if the focus was sharp at capture. Go over 5 pixels plus and over-sharpening haloes will creep in the edge details. If you can’t find a perfect value, err on the side of the over-sharpen (i.e. higher value), as their are several ways to fine tune the sharpen after you hit OK.
With the now sharpened copy layer selected, reduce the layer opacity. As the filter is applied to the duplicate layer at the top of the stack, we can decrease the opacity to bring our ‘softer’ source image through. The Overlay blend mode applies an average amount of sharpening, compared to other blend modes. Hard Light can be used to increase the effect, and Soft Light will reduce it. By adding a mask to the sharpened layer, we can paint out any elements that we find disagreeable using various opacity with a brush. This is somewhat similar to the Selective Sharpening technique covered here. High pass is a great sharpening tool, it aims for the edge detail, avoids any inherent noise in the image in the process, is non-destructive, and with plenty of options to tailor, definitely one to add to your image output workflow.